Midday: meeting for the Charnobylski Shlah (The Chernobyl Path), 66 Niezalezhnasci Ave. (Independence avenue) in Minsk. On 26 April, the anniversary of the Chernobyl nuclear accident, an annual demonstration Charnobylski Shlah (The Chernobyl Path) takes place in commemoration of the accident and the people who fell the immediate and lingering victims of it. Starting with the year of 1996 anarchists take part in the demo with ecological and antinuclear slogans. But nowadays the demonstration, instead of just mourning and commemorative event, is gaining a protest mood: in the country, where dozens of thousands people have died as a result of the nuclear accident aftermaths and hundreds of thousands have acquired accident-caused illnesses or become handicapped, a new NPS is to be constructed! And that is done according to the common regulations of an authoritarian police state not asking the peoples opinion, but just confronting them with the fact. On 26 April we will again take a most active part in the Charnobylski Shlah (The Chernobyl Path), well try to pass along to everyone our clear antinuclear position, will inform as many people as possible of the approaching danger. But now it is not enough! As an instrument of struggle against the state lawlessness we rely on the international support. We urge anarchists, environmentalists, antiauthoritarians of the world to carry out solidarity actions on 26 April 2009. We call for a decentralized day of action of any form, which could help people learn something about our problem and stop the impudent authority and their sponsors from IAEA. 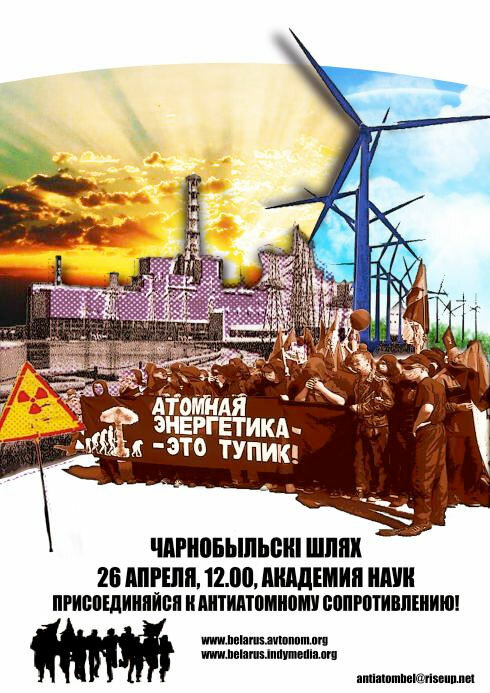 If you already take actions on 26 April on your local problems concerning nuclear power engineering, please put on your list the demand for abolition of the NSP construction in Belarus. You are also welcome to participate in The Chernobyl Path in Minsk and other actions in Belarus. Together we will be able to stand up for the right for life on a clean and ecologically safe planet!